Whose interests are given priority? The public or business? Is it a race to the bottom? Why do some people call is undemocratic? Is it luddite to oppose these deals? Twelve countries that border the Pacific Ocean signed up to the TPP in February 2016, representing roughly 40% of the world’s economic output. The agreement was designed so that it could eventually create a new single market, something like that of the EU. But all 12 nations needed to ratify it, before it could come into effect. Once Donald Trump won last year’s election, the writing was on the wall for the TPP. The Transatlantic Trade and Investment Partnership, now generally known as TTIP, is primarily a deal to cut tariffs and regulatory barriers to trade between the US and EU countries, making it easier for companies on both sides of the Atlantic to access each other’s markets. Industries it would affect include pharmaceuticals, cars, energy, finance, chemicals, clothing and food and drink. David Cameron is meeting other EU leaders and industry bodies at CBI-hosted talks in Brussels hoping to inject fresh impetus into talks on a transatlantic trade deal. Supporters say it will boost economies - critics call it anti-democratic. Since the passage of NAFTA in 1993, we’ve seen the loss of nearly five million US manufacturing jobs, the closure of more than 57,000 factories, and stagnant wages. This deal won’t be any different. Mr Turnbull says the government is satisfied it has made a strong case for an Australian exemption. who is right? Which is a race to the bottom, free trade or tariffs? In 1970, more than a quarter of U.S. employees worked in manufacturing. By 2010, only one in 10 did. Middle-skilled jobs are those that often involve routine tasks and are procedural or rule-based, making them easier to automate. On the other hand, low-skilled jobs are mostly service-oriented and high-skilled jobs involve analytical or managerial skills – both of which involve responsibilities that are more difficult to replace with a machine or computer, Tuzemen said. International trade and weaker unions have also contributed to the departure of men from the labor force, particularly as manufacturing jobs have moved to countries with lower wages. The men who have left the work force are unlikely to return if labor conditions remain the same, possibly due to a lack of available jobs suitable for their skill set, according to the paper. “If the US wants to reduce its trade deficit, it has to make Americans more hard-working and conduct reforms in accordance with international market demand, instead of asking the rest of the world to change,” it wrote. I’m going out on a limb here without evidence. Lagarde predicting that trade wars are unwinnable. Unlikely Lagarde ever traded anything in her life. Well, didn’t China win a few trade wars recently by producing a large quantity of goods cheaper than the other countries and selling them to eager traders who were quite happy to shun the locally produced stuff. Plus the fact that they enticed a large number of business leaders to switch production to China as well. So, yes, if you pick the right battles. Trump cites IP theft as a reason for this, alongside a trade deficit and loss of manufacturing. The theft of intellectual property from the US is “unprecedented” and costing the nation an estimated $300bn (£200bn) each year, a report says. The study, led by former top-ranking officials, said China was thought to be behind 50-80% of the theft. Stronger deterrent measures that made IP theft unprofitable were needed, the report said. These included banking sanctions and import or investment curbs on companies failing to protect IP rights. The non-partisan private commission was co-chaired by Dennis Blair, Mr Obama’s former director of national intelligence, and Jon Huntsman, former US ambassador to China and Republican presidential candidate. Its report comes weeks before a summit of the US and Chinese presidents, set for 7 and 8 June, at which the issue of Chinese cyber espionage is likely to be raised. Earlier this month, the Pentagon for the first time directly accused the Chinese government and military of targeting US government computers as part of a cyber espionage campaign aimed at collecting intelligence on US diplomatic, economic and defence sectors. China called the report “groundless”, saying it represented “US distrust”. How come it took until Trump to do anything real about this? I believe Japan was accused of the same thing in the 50’s and 60’s. The US didn’t do anything about that either. I wonder what has changed in the US that has made them sit up and notice now. Japan wasn’t making the network switches and routers that all information of any value is passing through (or accessible from) today. Good point but that would only be an argument for creating protection around IT equipment not aluminium and steel. Before routers and switches there was telecoms switches which were manufactured by numerous companies around the world but no-one felt the need for them to be manufactured in specific countries. 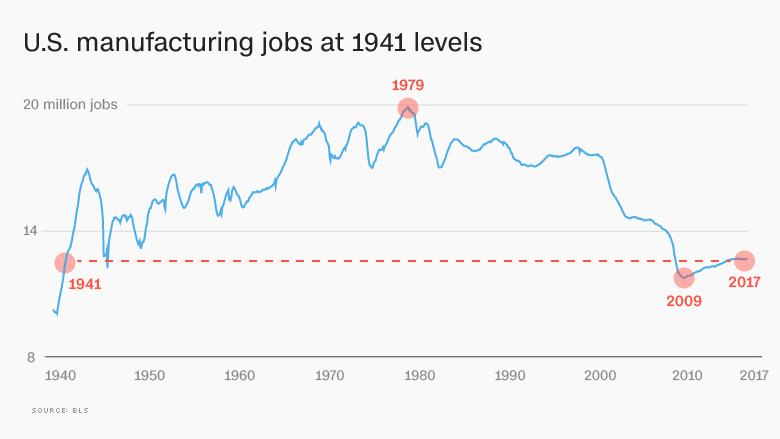 The US had a hell of a lot of manufacturing in the 50s and 60s even still until recently. Around 2000 is when it drops like a stone - What happened around then? According to a recent survey by the National Association of Manufacturers, 93% of its 14,000 members have a positive outlook for U.S. manufacturing. It’s the highest level of optimism in 20 years. The leading cause of growing U.S. trade deficits is currency manipulation, which distorts trade flows by artificially lowering the cost of U.S. imports and raising the cost of U.S. exports. More than 20 countries, led by China, have been spending about $1 trillion per year buying foreign assets to artificially suppress the value of their currencies (Bergsten and Gagnon 2012). Ending currency manipulation can create between 2.3 million and 5.8 million jobs for working Americans, and about 40 percent of those jobs (between 891,500 and 2.3 million) would be in manufacturing (Scott 2014). We also need to reform and aggressively enforce U.S. fair trade laws in order to reduce or eliminate the flood of illegally dumped and subsidized imports of steel and many other manufactured products (Stewart et al. 2014). A half century ago America’s largest private-sector employer was General Motors, whose full-time workers earned an average hourly wage of around $50, in today’s dollars, including health and pension benefits. Today, America’s largest employer is Walmart, whose average employee earns $8.81 an hour. A third of Walmart’s employees work less than 28 hours per week and don’t qualify for benefits. There are many reasons for the difference – including globalization and technological changes that have shrunk employment in American manufacturing while enlarging it in sectors involving personal services, such as retail. What is this guys solution? This is just another reason why Trump got in, the mainstream politicians are yapping about increasing mcdonalds workers pay to boost the economy while claming trade deficits are ok. The Republicans won’t do anything about it; it was a Republican administration that oversaw the collapse of manufacturing in the US. Will the Democrats? Probably not, they’re too up the liberal/fascist IT state’s arse (socially liberal, organisationally fascist). Let me see: globally, the number of people living in extreme poverty has more than halved in the last 25 or so years. For most of who, exactly, has globalisation been a bad thing?